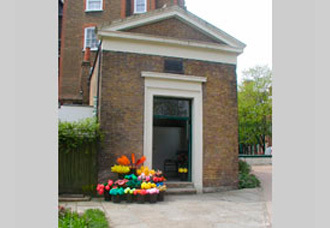 The chapel was built in 1806 to serve the last of Nicolas Hawksmore’s churches, St George’s in Bloomsbury. We used this space for an installation by Mary Anne Francis ‘Bloomsbury Blooms’ which used various cleaning utensils to create a magnificent flower arrangement and Lucy Heyward’s ‘Voices’ using archival recordings of people living and working in the area played simultaneously from 6 CD players. ‘Bloomsbury Blooms’, Mary Anne Francis, 2005.